EU summit participants have agreed that Russia should accept its responsibility for downing flight MH17 over Ukraine in 2014. "The European Council reiterates its full support for UNSC Resolution 2166 concerning the downing of flight MH-17. It calls on the Russian Federation to accept its responsibility and to fully cooperate with all efforts to establish truth, justice and accountability," the European Council said in its final conclusions of the first day of the EU summit held in Brussels. 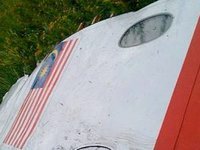 The Boeing 777 operated by Malaysia Airlines, en route from Amsterdam (the Netherlands) to Kuala Lumpur (Malaysia), was shot down in the sky over Donetsk region on July 17, 2014. There were 298 people on board. All of them died. Earlier, the Joint Investigation Team (JIT), which includes experts from Australia, Belgium, Malaysia, the Netherlands and Ukraine, said that a surface-to-air missile that shot down a passenger airplane in eastern Ukraine was in service with the 53rd Anti-Aircraft Missile Brigade of the Russian Armed Forces deployed in Kursk.